The AlpHouse Fair Stand informs about the transnational project AlpHouse, running from 2009 to 2012. 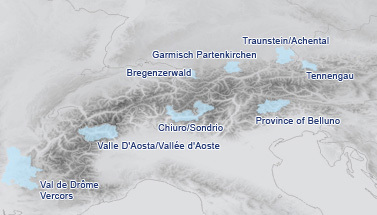 The stand focuses on the analysis work of the project partners in 9 alpine regions that aims at identifying challenges and chances for a new combination of Alpine building culture and energy efficiency. With these four main fields of work the AlpHouse Fair Stand represents the AlpHouse approach in Alpine building culture and energy efficiency on the basis of joint analyses of all project partners. The stand consists of a column, ten presentation tables, a book table with analysis documents and publications of the partners as well as a projection of photos. An interactive area (live construction site) with artisans aims at linking local craftsmanship and innovative technologies with the focus on local construction materials. The stand can be supplemented with further parts by the project partners in their regions, such as, for example, posters or models of regional architecture. Further project steps of AlpHouse in view of communication and training will be implemented during the tour of our stand throughout the regions of the project partners and on fair trades; the stand itself will accompany a number of events. Here you can find some information on the first public event where the Fair Stand was shown.